Lately, the cushion foundation is really booming. The whole beauty community, especially those who like K-Beauty, must be realizing this. 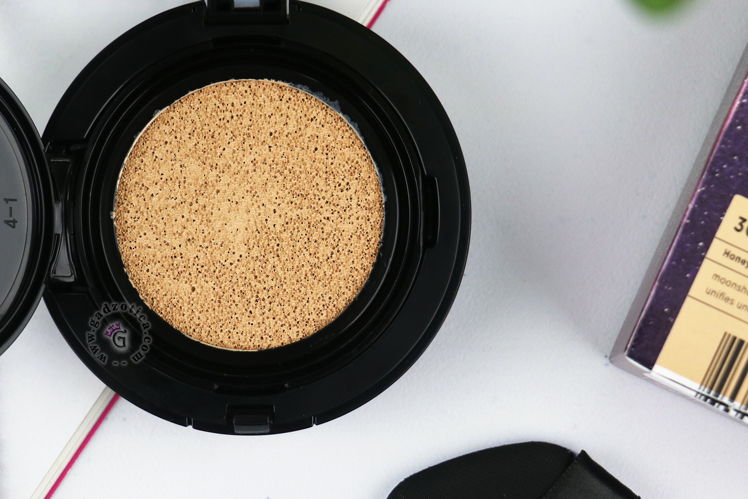 In addition to its compact size, the cushion foundation is practically brought and easy to reapply. Well, this time I want to discuss one of the popular cushion foundation because of Lisa Blackpink as the advertisement model. Yes! It's Moonshot Micro Correctfit Cushion. This Moonshot Correctfit series is the latest of Moonshot Cushion. Coming up with attracting packaging and better formulas, I can't help to try. The shade I'm trying is in 301. 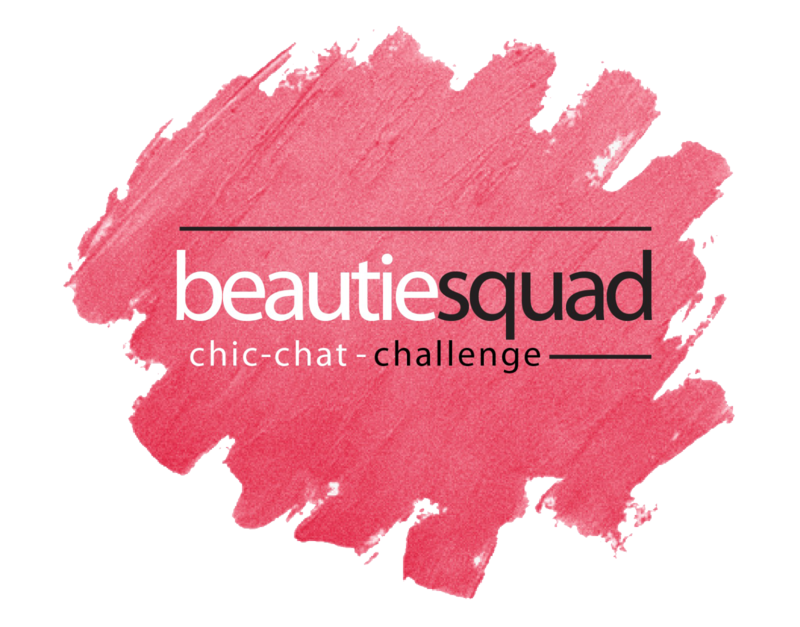 Are you curious about the performance and the results on my skin? Read this review until finished. Cosmax Co / COD COCOME INTERNATIONAL CO., LTD.
Seperti yang kalian lihat di foto diatas, boxnya didesain dengan background gambar galaksi. Karena aku suka banget sama hal-hal yang berbau galaksi, aku terpikat sama desainnya. Moonshot bener-bener tahu cara untuk menarik perhatianku. Nggak seperti cushion foundation Korea pada umumnya, Moonshot memberikan penjelasan produk dalam bahasa Inggris juga. Walaupun deskripsi yang diterjemahkan ke bahasa Inggris cuma yang penting-penting aja, ini sudah sangat memudahkan konsumen yang nggak paham sama huruf Korea sih. Aku sangat berterima kasih pada Moonshot yang sangat memikirkan konsumen mancanegara seperti kita ini. As you can see in the photo above, the box is designed with a galaxy background image. Because I really like the galactic things, I am captivated by the design. Moonshot really knows how to attract me. 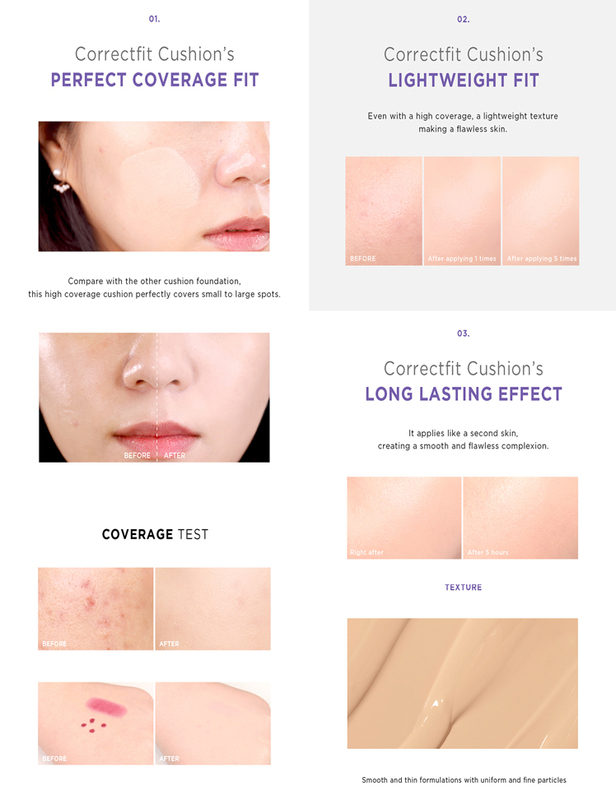 Unlike the Korean cushion foundation in general, Moonshot provides product descriptions in English as well. Even though the description translated into English is only the important ones, Moonshot has a great concern to consumers who can't understand Korean letters. I am very grateful to Moonshot who is very concerned about foreign consumers like us. Kalau box-nya dibuka, kamu disambut sama karakter M yang berpakaian astronot dan tertulis kalimat "JUST ARRIVED" dibawahnya. Seperti karakter astronotnya baru mendarat di bulan gitu. Tema keseluruhan keseluruhan saling berkesinambungan. Dan satu kata, CANTIK! If the box is opened, you are greeted by the character M who is dressed in astronauts and written the phrase "JUST ARRIVED" below it. Like the astronaut character just landed on the moon. The overall packaging theme is perfect. And one word, very beautiful! 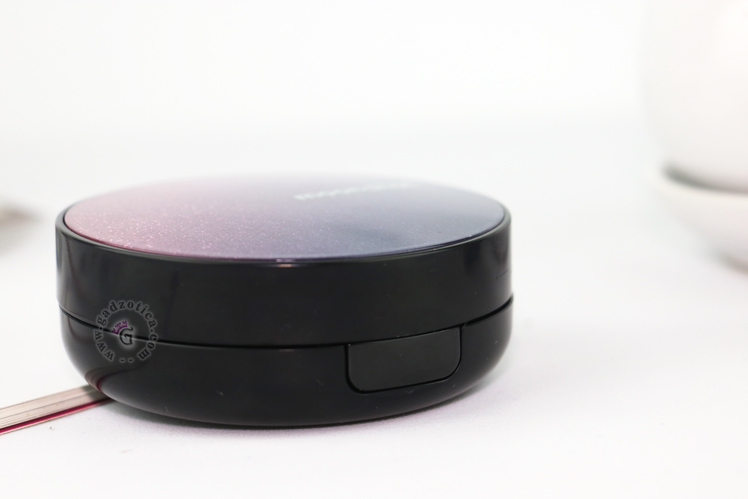 Penampakan case Moonshot Micro Correctfit Cushion ini nggak jauh beda sama kemasan box. 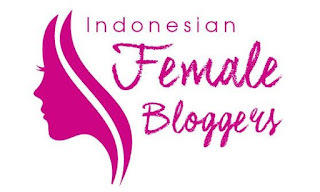 Masih dalam tema galaksi, gradasi warna pink-ungu bertaburan glitter bener-bener cantik. 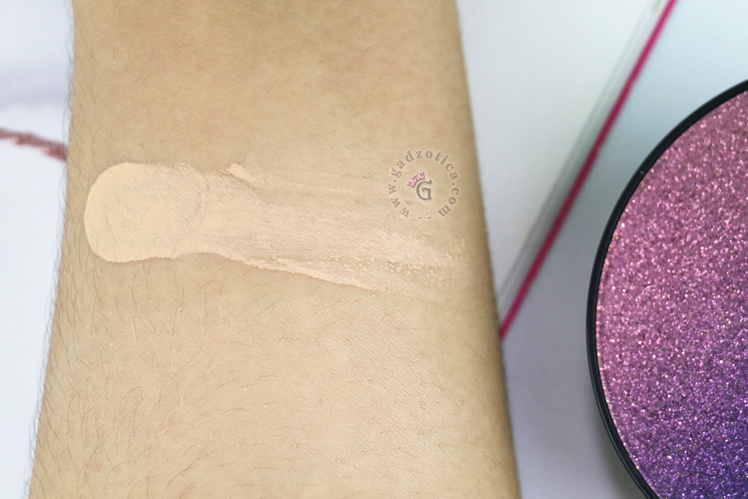 Dan glitternya ini ada dibawah lapisan luar yang warnanya bening, jadi nggak perlu takut glitternya hilang karena tergores. Aku langsung jatuh cinta pada pandangan pertama sama case-nya. 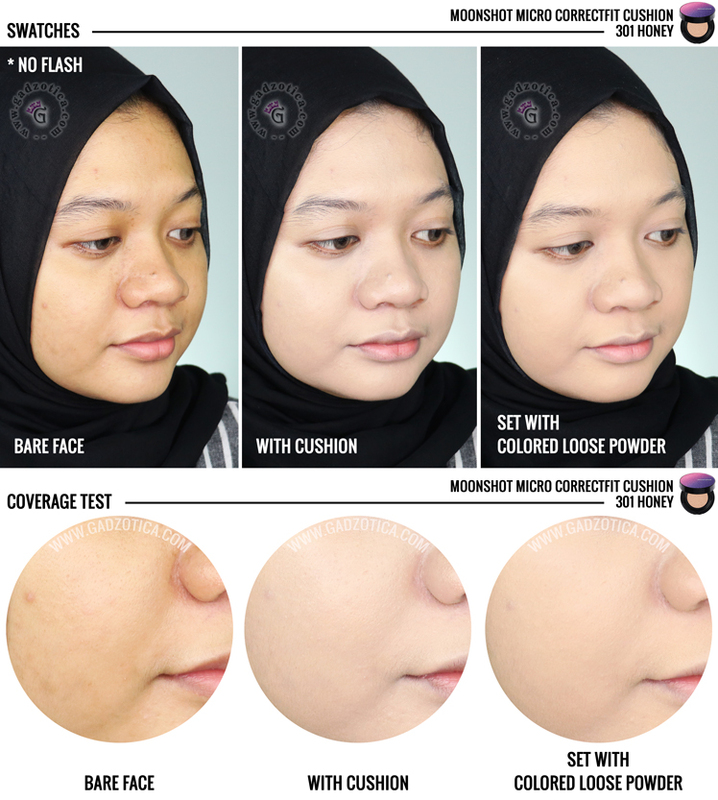 Menurutku, dari semua seri cushion Moonshot, seri Correctfit yang paling cantik. 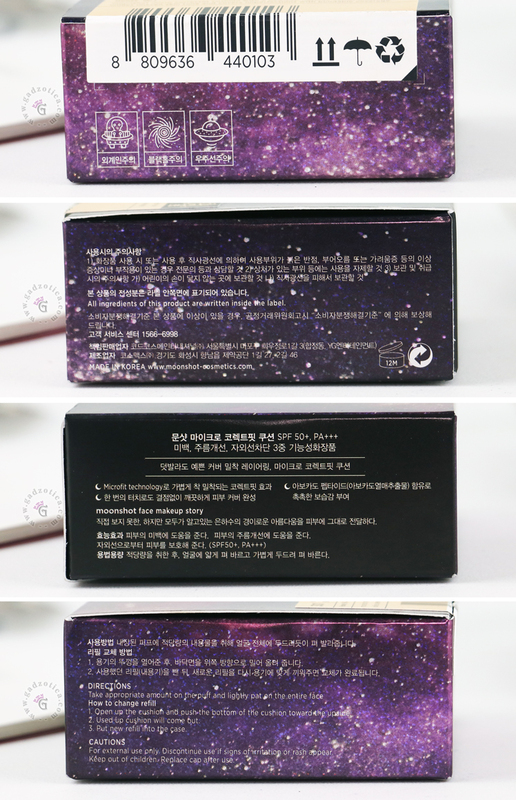 The appearance of the Moonshot Micro Correctfit Cushion case is not much different from the box packaging. 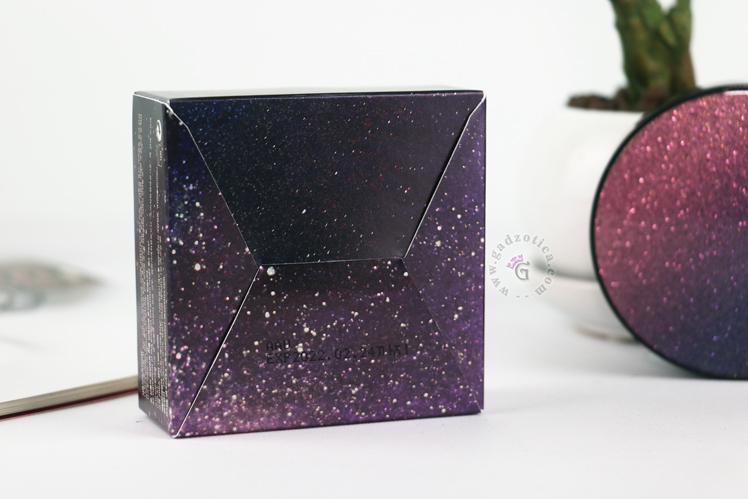 Still in the galactic theme, pink-purple gradations sprinkled with glitter are really pretty. And the glitter is under the clear outer layer, so there's no need to fear the glitter is gone because it's scratched. I fell in love at first sight with the case. In my opinion, Moonshot Correctfit cushion has the most beautiful design of all Moonshot Cushion series. 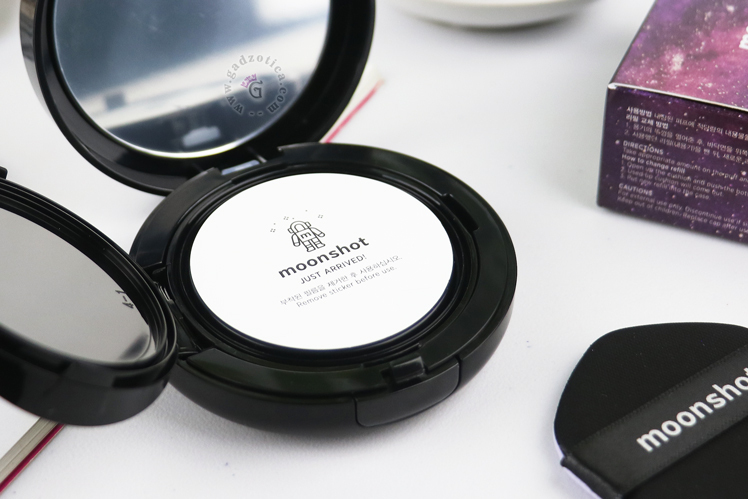 Shade yang kupilih adalah shade 301, yaitu warna tergelapnya Moonshot Micro Correctfit Cushion. Di label belakang ada tulisan kadar SPF yang dimiliki, netto, manufaktur, anjuran waktu pemakaian setelah dibuka, lambang recycle dan beberapa detail yang aku nggak ngerti karena ditulis dalam bahasa Korea. The shade I used is the shade 301, the darkest color of Moonshot Micro Correctfit Cushion. On the back label, there is information about the levels of SPF, net, manufacturing, recommended usage time after opening, the symbol of recycled and some details that I don't understand because it's written in Korean. Nggak jauh beda dengan cushion pada umumnya, Moonshot Micro Correctfit Cushion punya tombol untuk membuka cushionnya. Dan dari samping kelihatan cukup tebal. 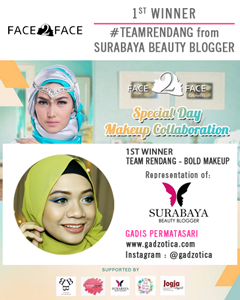 Tapi masih dalam ukuran wajar dan masih bisa dibawa di makeup pouch. 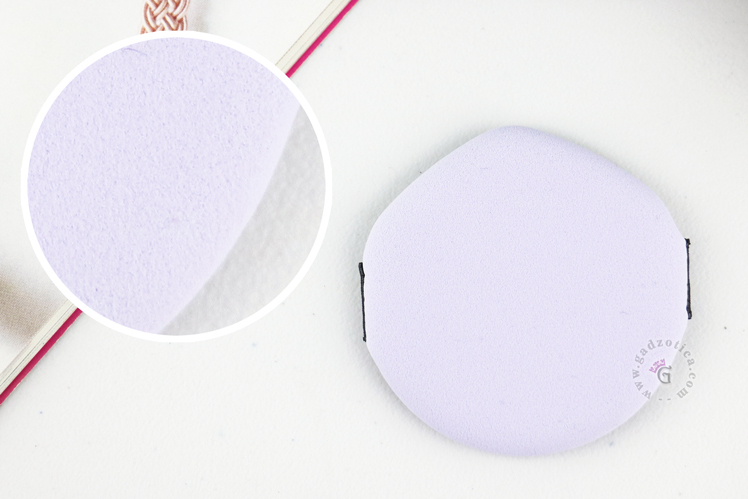 Not much different from the cushion in general, the Moonshot Micro Correct Fit Cushion has a button to open the cushion. And from the side, it looks pretty thick. But it's still in a reasonable size and can still be carried in makeup pouches. Seperti ini penampakan dalam cushionnya. Dalam 1 set cushion sudah disertai dengan sponge. Cerminnya waktu kufoto kelihatan buram karena lapisan plastiknya belum kulepas. This is the appearance of the cushion. In a set cushion, there is already a sponge in it. When I took this photo, the mirror seems blurry because I hadn't removed the plastic layer. Saat pembatasnya dibuka, bagian dalam cushionnya terlihat seperti ini. Ada stiker segel untuk menjaga isi cushion nggak terkena udara luar. Stikernya ini cukup tebal. Hampir setebal kertas karton. When the barrier is opened, the inside of the cushion looks like this. There is a sticker seal to keep the cushion contents not exposed to outside air. This sticker is quite thick. Almost as thick as paperboard. 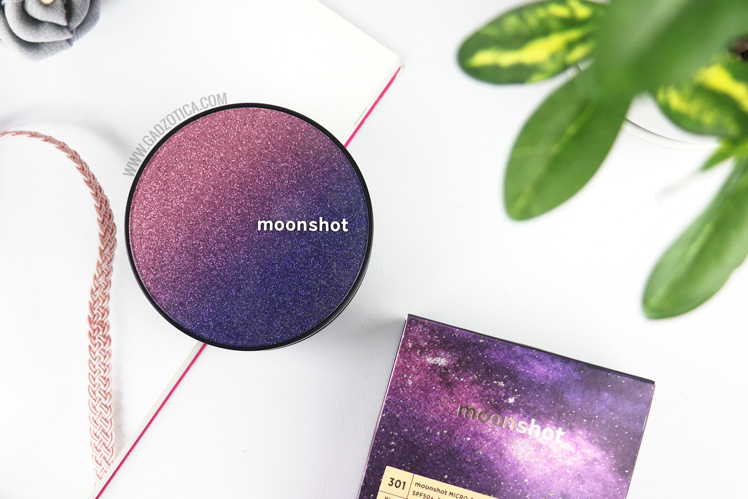 Berbeda dengan seri Moonshot cushion lainnya, Moonshot Micro Correctfit Cushion punya 3 pengait di pembatas cushion yang membantu cushionnya lebih tertutup rapat dan lebih kedap udara. Struktur kemasannya juga kokoh, engselnya nggak goyang saat pembatas cushionnya dibuka dan ditutup. Karena adanya pengait itu, diameter bagian dalam cushionnya jadi lebih besar dibanding seri lain. Nggak hanya diameter bagian dalam cushionnya, area untuk engsel juga lebih besar. Sesuai dengan informasi produk di website Moonshot Official, seri Correctfit nggak cocok dengan refill seri lain, dan sebaliknya. 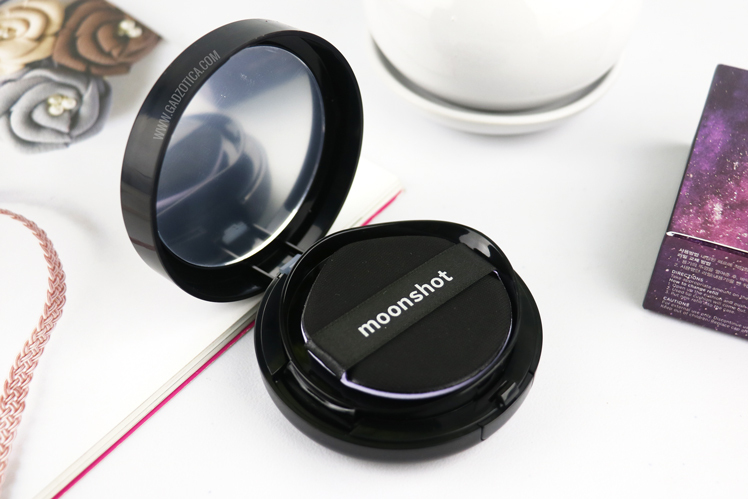 Akan tetapi, diameter luar case Moonshot Micro Correctfit Cushion masih sama dengan seri lain. Aku juga punya seri Moonshot Micro Settingfit Cushion nih. Nanti akan aku buatkan juga reviewnya ya. Different from the other Moonshot cushion series, the Moonshot Micro Correctfit Cushion has 3 hooks on the cushion that help cushion it more tightly closed and airtight. The packaging structure is also sturdy, the hinges don't shake when the cushion is opened and closed. Because of the hook, the inner diameter of the cushion is bigger than the other series. Not only the inner diameter of the cushion, but the area of the hinge is also larger. In accordance with product information on the Moonshot Official website, the Correctfit series does not match the other series refills and so does Correctfit refill with another cushion series case. 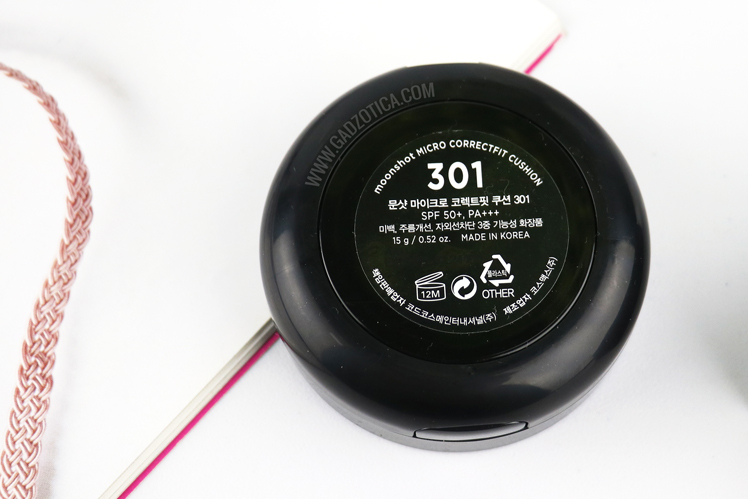 However, the outer diameter of the Moonshot Micro Correctfit Cushion case is still the same as the other series. I also have the Moonshot Micro Settingfit Cushion series. I'll review it later. Cushion puff-nya punya area bundar dan area meruncing yang bisa dipakai untuk mengaplikasikan cushion di area-area kecil seperti bawah mata atau lipatan hidung. Ada 2 warna yang mendominasi, yaitu hitam dan lilac. Pori-pori cushion puffnya cukup halus dan bisa mengaplikasikan tanpa menyerap banyak produk. The cushion puff has a round area and a pointed area that can be used to apply the cushion in small areas such as under the eyes or folds of the nose. The puff dominantly in black and lilac color. 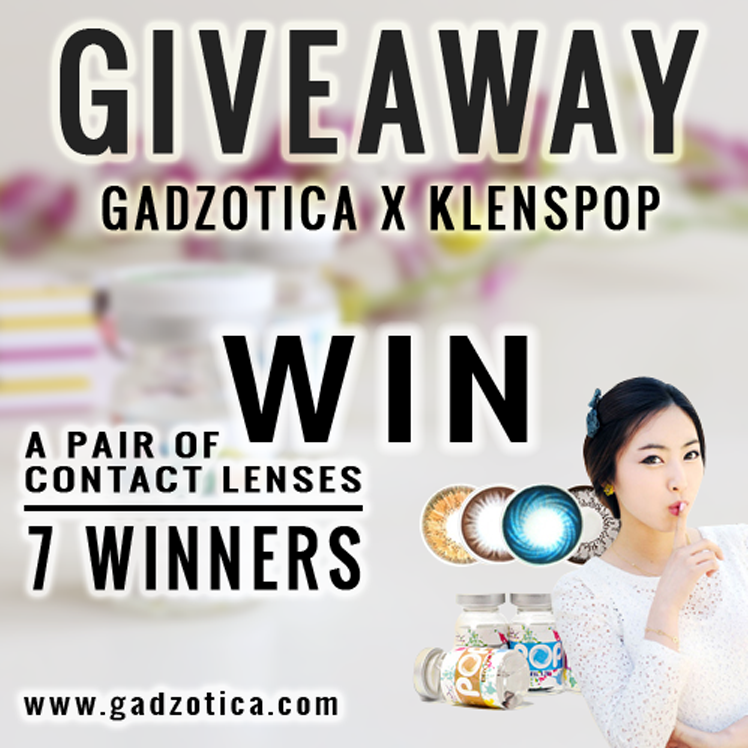 It has quite small pores and has a smooth surface. 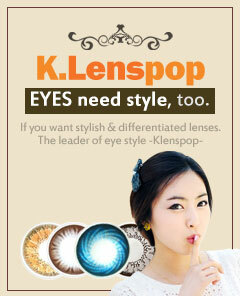 It can be applied without absorbing many products. 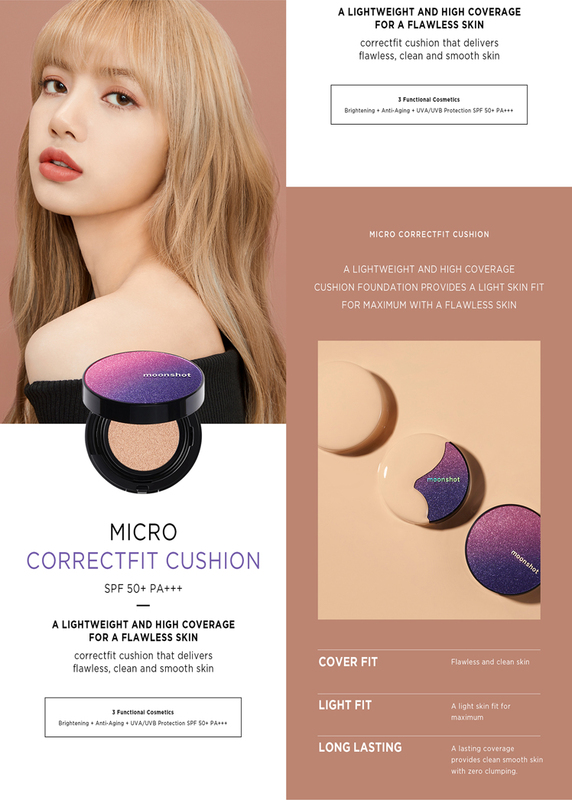 Moonshot Micro Correctfit Cushion punya bantalan cushion yang masih standar. Pas pertama kali buka segel dan memperhatikan pori-pori cushionnya, produk yang terserap di cushionnya full banget temen-temen. Nggak ada area kosong yang terlihat. The Moonshot Micro Correctfit Cushion has a standard cushion type. When you first open the seal and pay attention to the pores of the cushion itself, you can see that the products fully absorbed into the pores. There are no empty areas visible. Moonshot Correctfit Cushion 301 Honey ini punya hint peach. Warna peach masih dalam kategori aman untuk yang kulitnya kuning langsat karena nggak membuat warna kulit jadi abu-abu atau kusam. Aku nggak bilang warnanya kuning karena Moonshot mendesripsikan shade 301 sebagai healthy honey color. Kalau dilihat di katalog, warna 301 kelihatan paling kuning dibandingkan 2 shade lainnya. Kulitku cenderung light-medium dengan hint yellow/ olive, jadi warna yang muncul lebih ke peach. Bagaimanapun, warna 301 di tanganku kelihatan masih oke nggak terlalu terang. 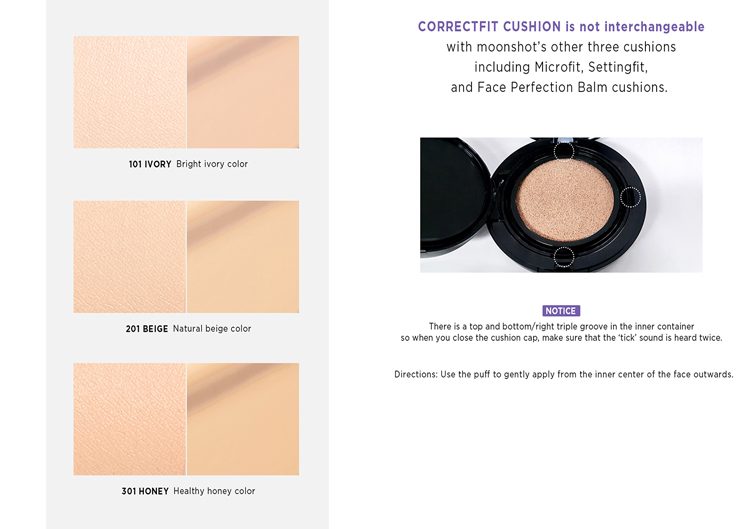 Moonshot Correctfit Cushion 301 Honey has a peach hint. The color is still safe for those with soft yellow skin because it doesn't make the skin color gray or dull. I do not say the color is yellow because Moonshot describes 301 as healthy honey color. But as you can see in the catalog, the color looks the most yellow compared to the other 2 shades. My skin tends to be light-medium with a yellow/ olive hint, so the color appears more into peach color. After all, the color 301 in my hand seems still okay and not too bright. 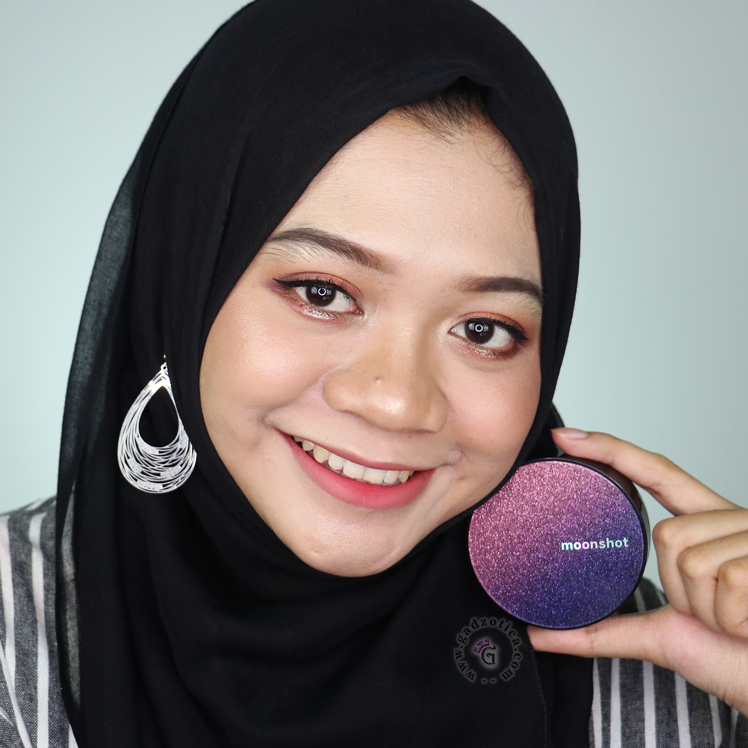 Formula Moonshot Micro Correctfit Cushion nggak terlalu cair dan nggak terlalu kental. Dia punya hasil satin finish dan memberi kesan glowing alami. Di kulit kombinasi-sensitifku, hasilnya nggak terlalu basah dan nggak terlalu kering. Aku juga nggak merasakan gatal atau gejala iritasi ketika pakai cushion ini. Semuanya berjalan dengan baik. The Moonshot Micro CorrectFit Cushion formula is not too liquid and not too thick. He has a satin finish and gives a healthy, glowing skin look. In my sensitive skin, the results are not too wet and not too dry. I also don't feel itchy or irritable symptoms when using this cushion. Everything is going well. 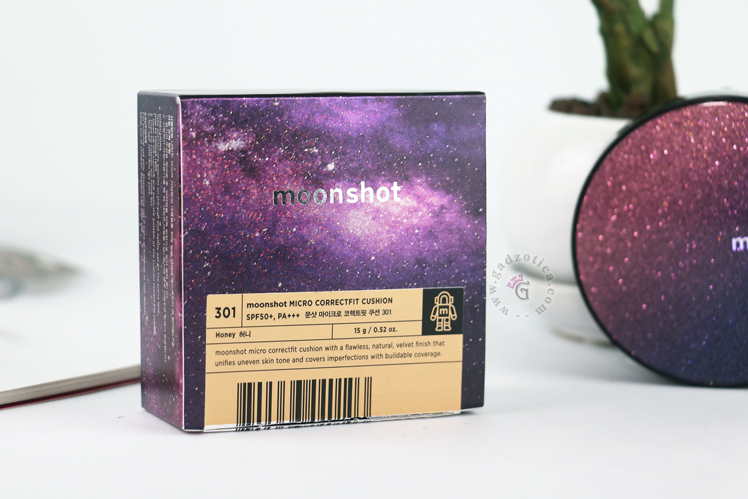 Moonshot Micro Correctfit Cushion punya aroma floral yang lembut. 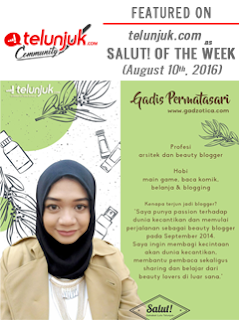 Buat aku yang nggak terlalu suka sama aroma floral, aromanya cukup bisa diterima hidungku dan nggak terlalu mengganggu. Moonshot Micro Correctfit Cushion has a soft floral scent. For me who doesn't really like floral scents, the aroma is quite acceptable and not too annoying. 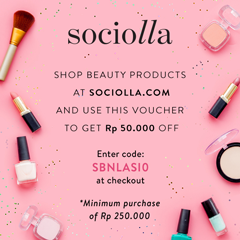 Setelah diaplikasikan, kelihatan kalau shade 301 warnanya 1 tingkat diatas warna kulitku dan hasilnya peach. Coveragenya medium to full dan buildable. Dan aku cuma pakai 1 layer aja sudah bisa menutup bekas jerawat tipis. 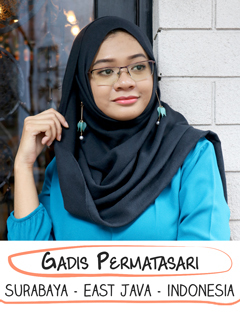 Untuk jerawat/ bekas jerawat yang warnanya lebih pigmented, aku harus tambah jadi 2 layer untuk menutupi warnanya. Waktu dilayer pun, tekstur dari cushionnya nggak berubah. Nggak patchy dan nggak cracking. Setelah diset pakai bedak juga lebih mulus. After applied, the shade 301 is 1 level brighter than my skin color and has a peach hint. The coverage is medium to full and buildable. I only use one layer and it can cover my thin acne scars. For more pigmented acne/ acne scars, I have to add 2 layers to cover the color. Even when layered, the texture of the cushion doesn't change. It's not patchy and not cracking. After being set using powder, it is also looking smoother. Nah hasil pemakaian Moonshot Correctfit Cushion bisa dilihat difoto di atas. Disini kelihatan jelas banget kalau tone kulit asliku sangat yellow-olive sedangkan cushionnya peachy-tone, ditambah warnanya yang memang masih lebih terang dibandin warna kulitku. Walaupun begitu, bukan berarti nggak bisa dipakai sama sekali. Masih bisa banget diakali pakai bedak yang warnanya sesuai sama warna kulit kalian. 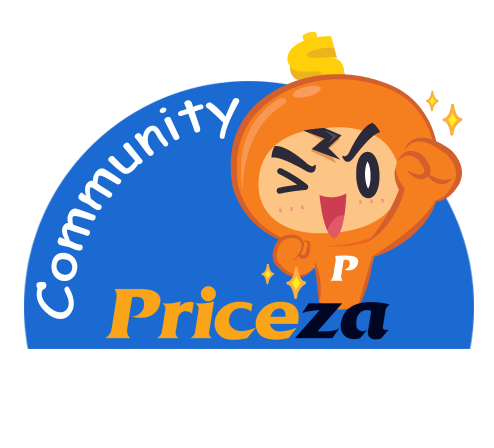 Disini aku pakai bedak tabur dan hasil akhirnya lebih kekuningan walaupun masih ada hint peach-nya. Hint peach ya bukan hint pink karena nggak abu-abu/ kusam setelah dipakaikan bedak. Kalau mau warnanya lebih mendekati warna kulit kalian, aku sarankan untuk pakai bedak padat. Now the results of using the Moonshot Correctfit Cushion can be seen in the picture above. It seems very clear here that my real skin tone is very yellow-olive while the cushion is peachy-tone, plus its color is brighter than my skin color. Even so, it doesn't mean it can't be used at all. You can use a powder that matches the skin color. It will become more yellowish, although there is still a hint of peach. But still, it doesn't make my face look gray/dull. If you want the color more into skin color, I recommend using compact powder. Moonshot Correctfit Cushion mengandung SPF 50 PA+++. Nggak perlu diragukan lagi, pasti muncul whitecast ketika kena flash kamera. Aku juga tes flash untuk kondisi cushion yang sudah di-set dengan bedak. Selain pantulan glowingnya berkurang, whitecastnya mulai bersahabat dan warnanya jadi lebih bisa diterima mata. Menurutku Moonshot Correctfit Cushion masih bisa banget dipakai foto flash asal di-set pakai bedak dulu. The Moonshot Correctfit Cushion contains SPF 50 PA +++. No need to doubt, the white cast will appears when the cushion hit by a camera flash. I also have a flash test for cushion conditions that have been set with powder. Besides the glowing reflection is reduced, It becomes white cast friendly and the color becomes more acceptable. 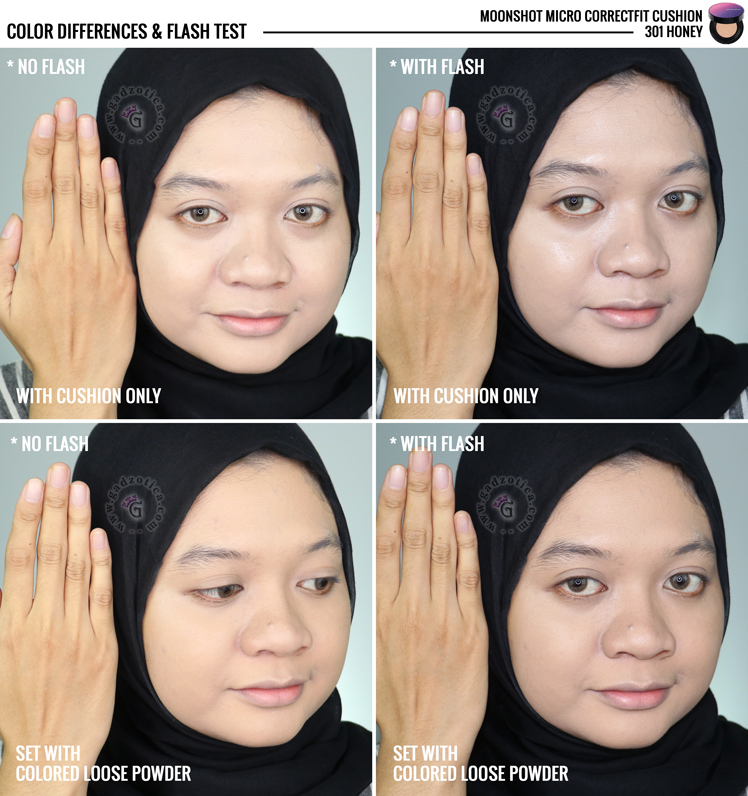 I think the Moonshot Correctfit Cushion can still be used in flash photo as long as it's set by using powder first. Selain karena jenis kulitku yang kombinasi, kondisi cuaca Indonesia yang panas dan warnanya yang masih kurang kuning membuatku lebih suka set cushionnya pakai bedak. Awal pemakaian hasilnya mulus banget. Setelah 3 jam, bagian hidung dan lipatan hidungku mulai berminyak tapi cushionnya masih menyatu dan nggak patchy. Setelah diblot tissue pun, cushionnya masih nggak patchy/ cracking. Coverage setelah diblot agak berkurang, tapi masih kelihatan kalau ada cushionnya. Nah, pasti banyak dari kalian yang penasaran awet atau nggak dipakai wudlu. Setelah diguyur air wudlu, air yang menetes warnanya butek temen-temen. Entah bedaknya atau cushionnya yang luntur nih. Dan waktu kubiarin airnya kering semacam blentong-blentong. Tapi kalau air wudlunya langsung diblot tissue, hasilnya masih oke. Coveragenya lebih tipis memang. Tapi kelihatan masih mulus dan warnanya jadi 1 tone mendekati warna kulit. Karena coveragenya jadi lebih tipis, aku coba re-apply. Hasil setelah re-apply nggak membuat layer sebelumnya jadi patchy. Nge-blend lebih baik dan warnanya nggak berbeda dengan awal pemakaian pertama. Warnanya nggak oksidasi sesuai klaimnya. 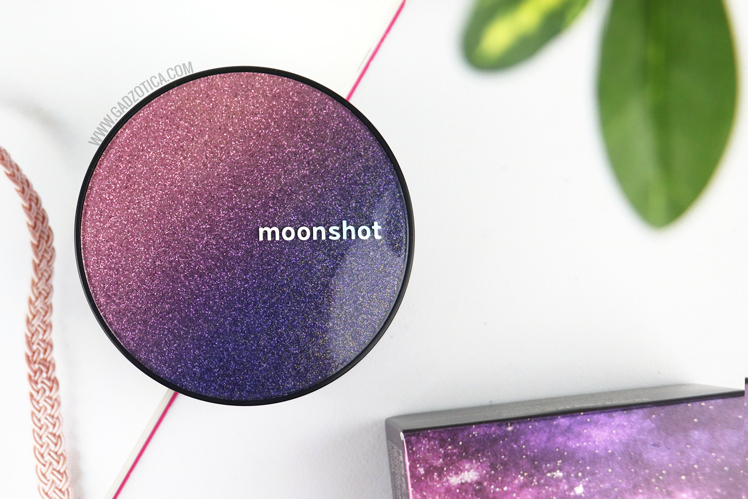 Jadi kalau pilih warna cushion Moonshot yang senada sama warna kulit masih aman. Setelah pemakaian 6 jam. Aku pernah pakai Moonshot Micro Correctfit Cushion kurang lebih selama 6 jam dan kulitku terlihat glowing di area T-Zone. 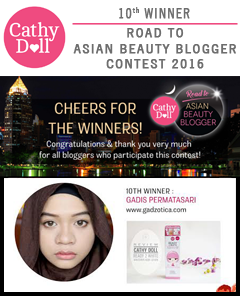 Glowingnya bukan basah dewy gitu, tapi lebih kaya kulitmu glowing from within. 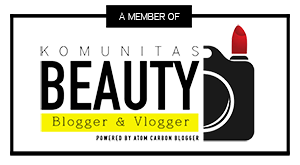 Minyak alami wajah dan cushionnya itu nge-blend, nggak patchy, nggak cracking. Tetep flawless seperti hasil pemakaian awal. Long lasting powernya nggak main-main. Apart from my combination of skin types, Indonesia's hot weather conditions and less yellowish color range make me prefer to use powder again after using this cushion. The result is very smooth. After 3 hours, it's starting to glow in my T-Zone area, but not patchy or crack. Even after blotting with a tissue, the texture is still okay. I realize that the coverage is faded, but the cushion is still there. Well, surely many of you are curious about the performance of this cushion after being washed with wudlu water. After wudlu, I notice that the water drops are in brown color. I don't know if the powder or the cushion is faded. And when I let the water dry, the color sticks and it's really not nice to see. I tried to blot the water using a tissue, and the results are still fine. Indeed the cover is more faded, but it looks still smooth and the color becomes 1 tone closer to skin color. When I try to reapply, it doesn't make the previous layer patchy. It is as well as applying the cushion for the first time. The color is not oxidizing according to the claim. So if you choose the Moonshot cushion color, I think it will be safe to choose colors that match your skin tone. After 6 hours using this cushion, I notice my skin looks glowing in the T-Zone area. It's not super glow, but your skin looks glowing from within. The natural face oil and the cushion blend naturally, not patchy, and not cracking. And it still looks flawless. The long-lasting power is tremendous. Kalau banyak yang bilang Moonshot Micro Correctfit Cushion BAGUS BANGET, aku bisa katakan YES! IT DOES! Setelah beberapa kali pemakaian dan beberapa tes yang kulakukan, hasil cushion ini memang sebagus itu. Terutama untuk iklim tropis seperti Indonesia. 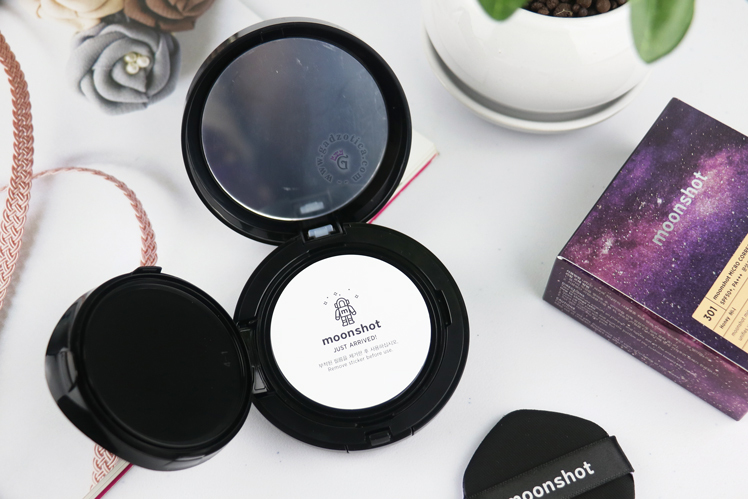 Moonshot Micro Correctfit Cushion adalah cushion favoritku dan yang paling sering kupakai. Karena shade 301 masih kurang kuning, aku harap Moonshot mengeluarkan variasa warna lebih banyak lagi supaya yang punya warna kulit kuning langsat atau sawo matang bisa cobain juga. 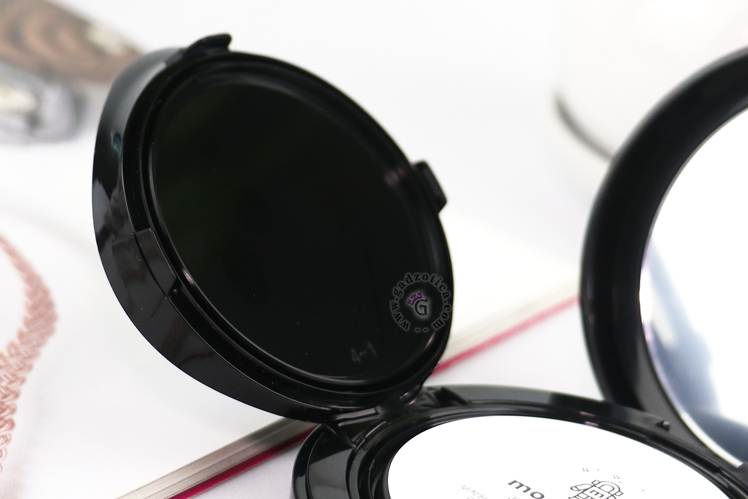 If many said that Moonshot Micro Correctfit Cushion is INCREDIBLY GOOD, I can say YES! IT DOES! After using it several times and some tests that I did, this cushion is indeed that good. Especially for tropical climates like Indonesia. 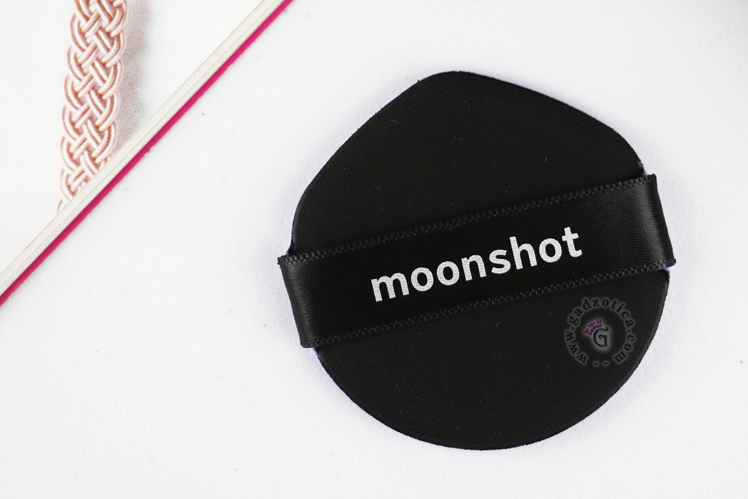 The Moonshot Micro Correctfit Cushion is my favorite cushion and the one I use the most. Because the shade 301 is still less yellow, I hope Moonshot releases more color variants so that those who have yellow, olive or brown skin color can try it too. Woooww finishnya cakep deh, so smooth! Sayangnya kulitku yang sawo matang ini sering kurang beruntung sama cushion Korea karena shadenya rata-rata terang.